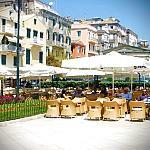 We welcome you to the famous Island of Corfu and more specifically to a Barbati, one of the most wonderful and award winning beaches with incredible view that combine the ultimate green mountains and the Ionian blue sea. Two bedroom apartments, with 2 bathrooms, fully equipped kitchen and living room with satellite TV. Three bedroom apartment, with 1 bathroom, fully equipped kitchen suitable for large families. In the large courtyard you can enjoy with your family leisure time and wellness enjoying the magic of nature between the mountains and Ionian sea. You can spend ideal time on the large terrace with magnifisent sea view or you can enjoy for free the swimming pool at Crystal Blue resort (150m away). Joanna Barbati apartments are suited in a landscape full of olive trees, Leandro bushes and garden with many flowers framed by our 3 apartments. Our friendly staff can facilitate guests with car/ bike and boat rental as well. All our guests get for free a discount card for tavernas, gift shops, water sport , boats etc. in Barbati and Nissaki , our guest can make their shops in a super market and deliver their shops at the apartments.